There’s enough science out there to prove that indoor air is generally worse than outside air. While we strive to improve the air quality in our homes, one place where many of us spend considerable amount of time is in our cars while commuting. If your commute is longer than 15 minutes and you live in any of the highly polluted cities of India, having an air purifier in your car is a must. 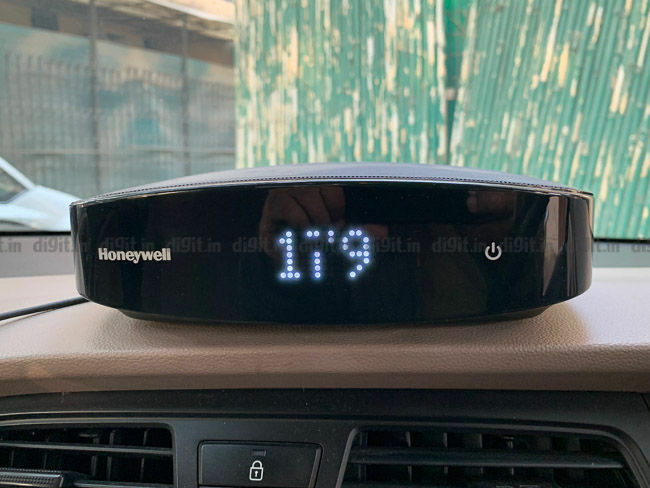 We tested the Honeywell Move Pure 2 car air purifier which costs Rs 14,999 to see just how effective it can be in Delhi’s pollution. The Honeywell Move Pure 2 air purifier is built primary of ABS plastic, with bits of metal wire mesh. It has a shape similar to that of a lunch box, but the gentle curvature of the device makes it ideal for placement on the dashboard. The entire top of the Move Pure 2 is a metal grill that, when removed, reveals the combined HEPA+carbon filter. Below the filter sit two small fans, almost like laptop fans, that are responsible for moving 15 cubic feet of air. On the sides, you will notice exhaust vents. The front of the Honeywell Move Pure 2 is incredibly minimalist, with a transparent panel that displays the PM2.5 levels and no other information. The power button on the side is a touch sensitive unit and besides a beep, offers no other indication of operation. While the overall construction and design of the Move Pure 2 is impressive, what we do not like is the lack of an indication of fan speed. For anyone new to the air purifier, you’re going to be very confused at the beginning since there are no visual operational cues. Tapping the power button once turns it on and you’ll hear a beep. Tap it again to hear a double beep and you’ll know that it is now spinning at its fastest speed. The lack of any visual indicators about the operations is a bummer, which we hope the company will fix in the next iteration of the product. In order to test the performance of the air purifier, we ran the air purifier for 45 minutes, recording the metrics every 15 minutes. We did multiple runs are varying pollution levels, and recorded the metrics under two conditions; with the air conditioner turned on and air conditioner turned off, with outside air being allowed into the cabin of our test car, a Hyundai Elite i20. This is how the Honeywell Move Pure 2 fared. One of the best ways to keep out outside pollution is to of course set the air conditioner to recycle inside air. But what that also means is that you’re trapped inside your air with polluted air. We fired up the air purifier at its full speed due to high pollution levels. We started at a PM2.5 level of 540. In 15 minutes, the air purifier managed to get the PM2.5 levels down to 394, a roughly 27 percent reduction. After 30 minutes, the PM2.5 count in the car’s cabin was reduced to 112. Once we crossed the 45-minute mark, the air quality monitor on the Honeywell Move Pure 2 showed a PM2.5 count of 18. 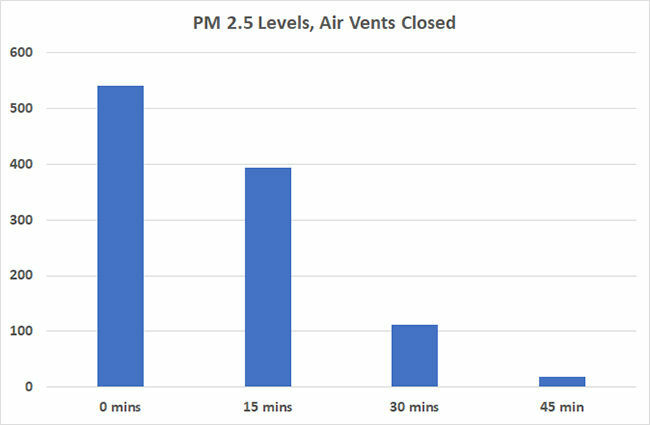 Similarly, we noted that even with the external vents open, it took the Honeywell Move Pure 2 to bring the PM2.5 levels down from 380 to 14 in 45 minutes. At the 30-minute mark, the PM2.5 levels were still at 112, a number still high enough to consider air unhealthy. The prescribed safe limit for PM2.5 is 60, above which, it is deemed unhealthy. In our observation, with the car cabin sealed off to the outside air, Move Pure 2 is able to get the numbers below 60 within roughly 35-40 minutes, at full speed. Unfortunately, due to the small fans, the air purifier isn’t able to get the PM2.5 numbers below safe limits fast enough. 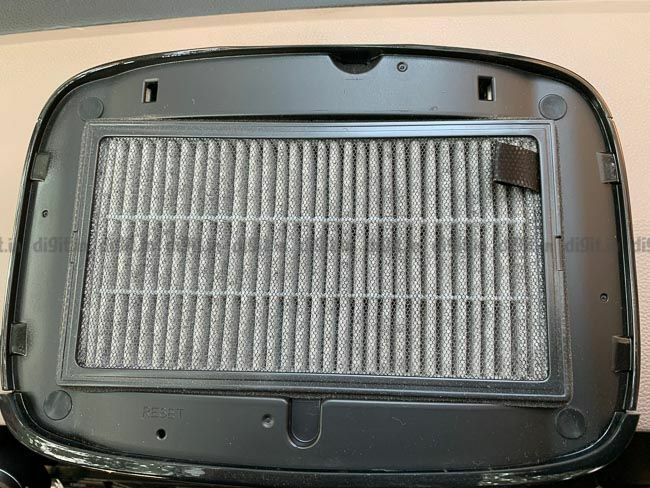 It works well if your commute is long, but for those who don’t end up spending longer than 30 minutes in the car at a time, it won’t yield the benefits one would expect from having an air purifier in the car. The Honeywell Move Pure 2 car air purifier does its job of cleaning up the air inside to a satisfactory level. In fact, on multiple occasions, the air purifier was able to bring PM2.5 levels into single digits. The only problem is, it takes some time to achieve that goal, almost 40 minutes. Thus, if your commute is 30-40 minutes (or longer), you would be spending your money on a great tool. However, if your life involves short drives, then you’re better off looking at other options.